The 2016 MCANA meeting will be held at the Spoleto Festival USA in historic Charleston, SC from May 31 to June 3. We will hear the new David Herskovits production of Porgy and Bess featuring Lester Lynch and Alyson Cambridge at the renovated Gailliard Auditorium; the U.S. premiere of "The Little Match Girl" (1990) by Helmut Lachenmann, with Heather Buck and Yuko Kakuta, and the U.S. premiere of Double Coquette, an infrequently encountered comic opera by Baroque composer Antoine Dauvergne (with revisions by Gérard Pesson) by the early music specialists Ensemble Amarillis. In addition to the usual chamber concerts at 11 a.m. and 1 p.m.--Osvaldo Golijov is composer-in-residence this year--there will be walking tours centered around the Charleston roots of "Porgy and Bess," led by visual designer and artist Jonathan Green, who grew up among South Carolina's Gullah community. Details on lodging options (dorm rooms; hotel group rate) and panels will be updated on this page as they become available. 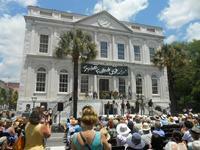 Special Press Rates will be available to MCANA members at several hotels convenient to the Spoleto USA Festival sites. Rates vary, depending on the hotel and dates, from $185 to $429 per night. Access codes will be provided upon receipt of registration form and payment. Meeting registration deadline is April 1st. After that date, a late payment will apply. The press seat request deadline is April 1st. Press seats can not be guaranteed for registrations received after that date. The various hotels have cut-off dates for access to the special room rates and dorm room availability. The cut-off dates vary, but most end by mid April.